The annual White House Science Fair is always a heartening occasion. Watching President Obama ramble around and shoot the breeze (and sometimes marshmallows) with a bunch of smart, nerdy kids is entertaining, and the projects are often pretty impressive. This year’s fair is, of course, the last in the president’s term, and it promises to be a good one, if the list of exhibits and exhibitors is anything to go by. Kimberly (9) and Rebecca Yeung (11), who launched a camera-equipped balloon into the stratosphere with a little help from GoPro. Hannah Herbst (15), who’s working on a device that harvests power from ocean currents. A whole gaggle of Girl Scouts from Troop 1484 in St. Louis, who created a safe way to dispose of Styrofoam, then realized the byproduct was a cool adhesive, and patented it. Amro Halwah (18), Stephen Mwingria (17) and Si Ya Ni (18), who got tired of trash fires delaying their subway trips (!) and made a robot that cleans the rails. Yashaswini Makaram (17), who created a way to identify a phone’s owner and unlock it based just on the way they pick it up. Hari Bhimaraju (12), who made “The Elementor,” a tool for teaching visually impaired students about the periodic table. Gabriel Mesa (16), who used graphene to create a non-chemical, non-toxic battery. Shemar Coombs (19), who made a 3D-printed cell phone case that integrates a headphone wrapping feature. And a whole bunch more. Honestly, a lot of these are such cool ideas that it’s embarrassing I haven’t heard of them before. 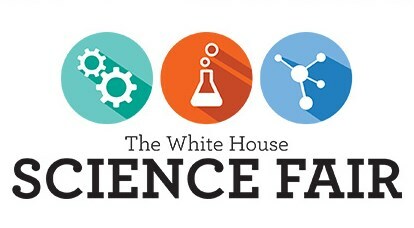 I’m really looking forward to the Science Fair, which will stream live at Whitehouse.gov on the 13th at 5 PM ET.